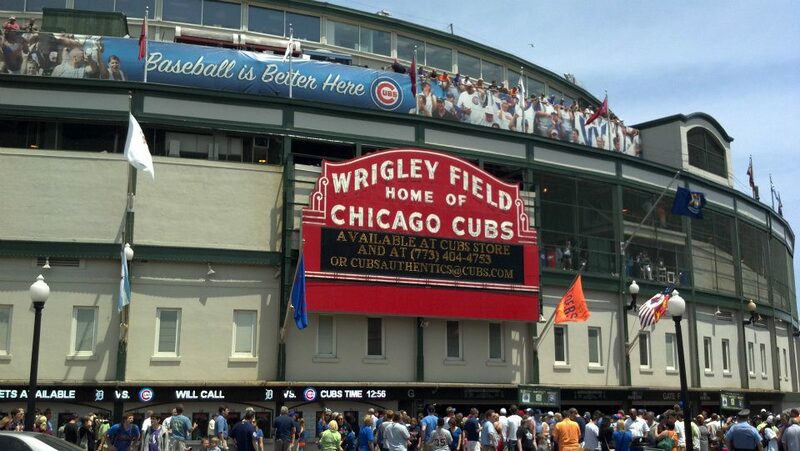 Yesterday, Wrigley Field celebrated its 100th Birthday. 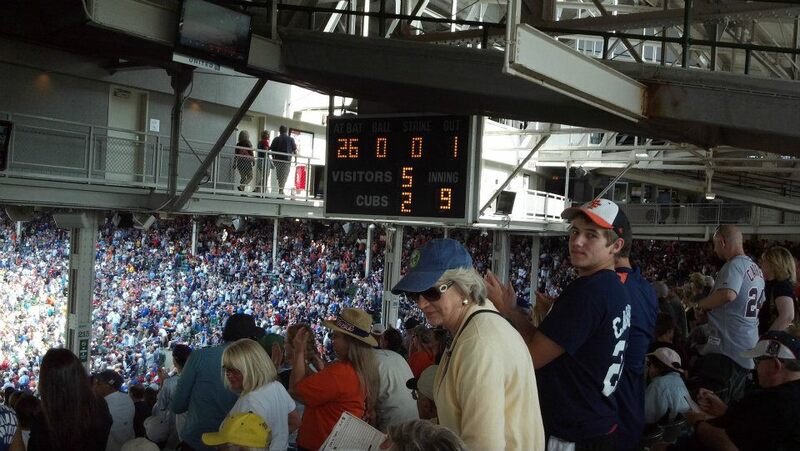 So, I thought it would be fun to take a “Throwback Thursday” to remember my one and only trip to this famous ballpark. 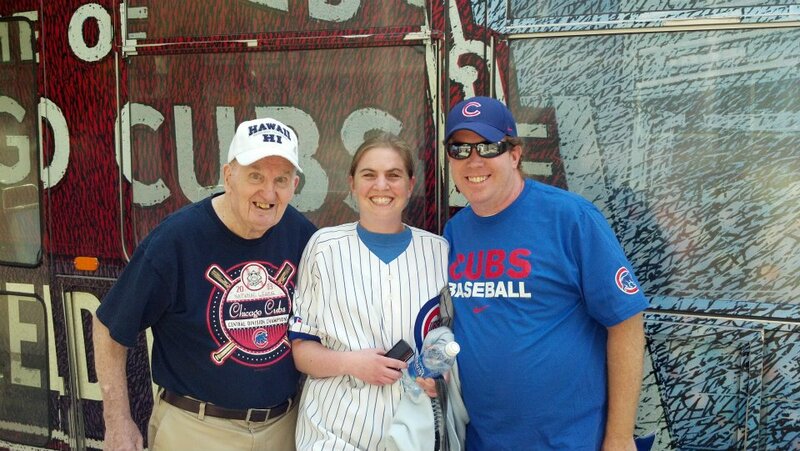 In June of 2012, Brooke and I took a trip to Chicago to visit her grandfather. It gave us the opportunity to visit him as well as see a baseball stadium I had dreamed of visiting since I was a kid. Brooke’s grandfather is a huge Cubs fan. He’s been to many games at Wrigley. One of the games he went to is probably the most infamous game at the historic stadium. He was at the World Series game between the Cubs and Yankees where Babe Ruth, legend says, called one of his home runs. According to Brooke’s grandfather, there was no way he called that home run. He sat in left field for the game and got to be in the presence of one of baseball’s most famous players. Brooke’s grandfather lives in the suburbs of Chicago. 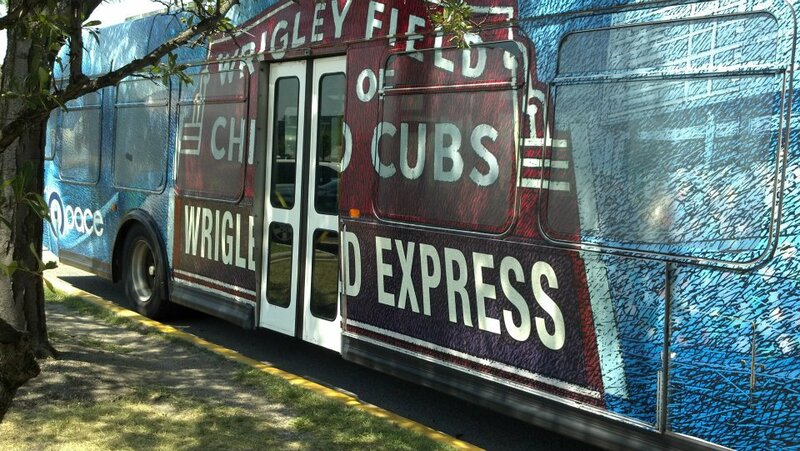 Close to the place where he lives, they have the Wrigley Express bus that takes people to the stadium. The price is pretty inexpensive. So, we decided this would be the way to go. It was fun. The driver served as a tour guide as well and was so funny. The bus parked close to the stadium. On the way, I was taking everything in. 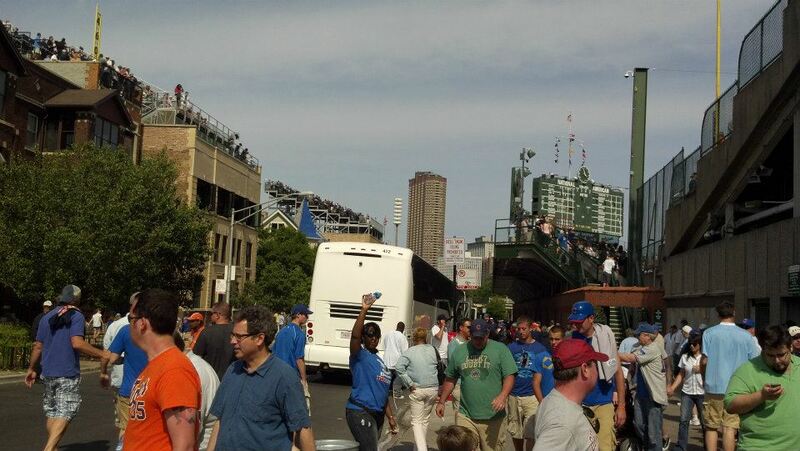 Back in the day, the bleachers on top of the buildings behind the stadium didn’t exist. 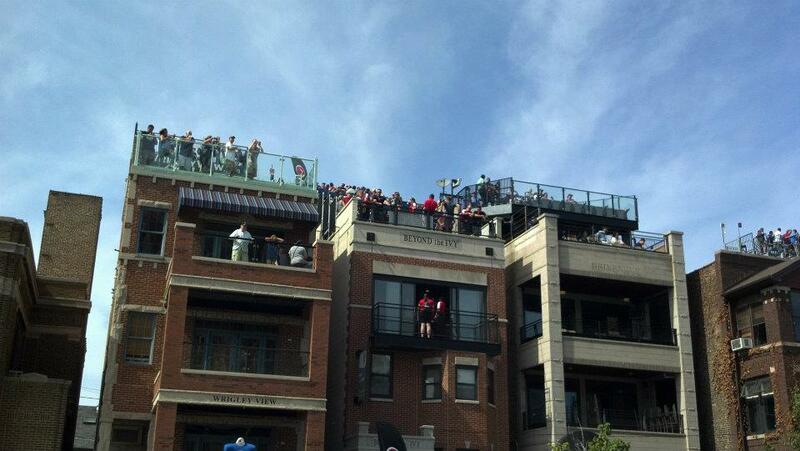 However, people would watch the game from on top of these buildings without the bleachers. 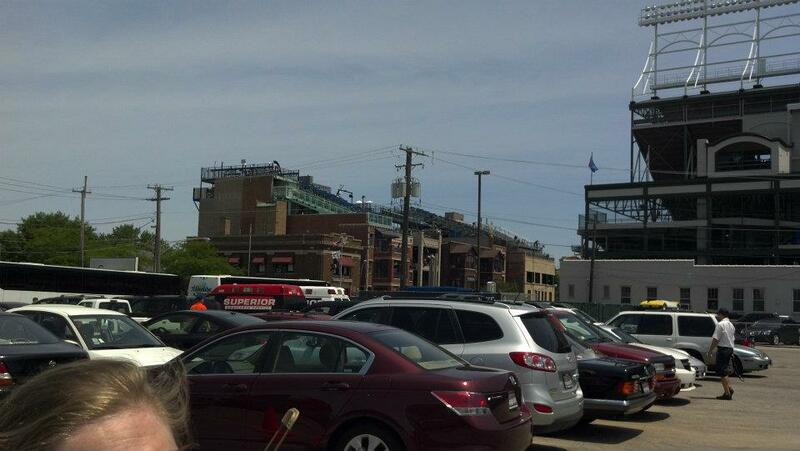 You should know that there is a street that runs behind Wrigley Field and the buildings in the picture above. This picture was taken inside the stadium. However, on the way in, there was a pre-game party going on here. There was a band playing and lots of people milling around. We passed this area on the way in. Then, we came to see the famous sign! 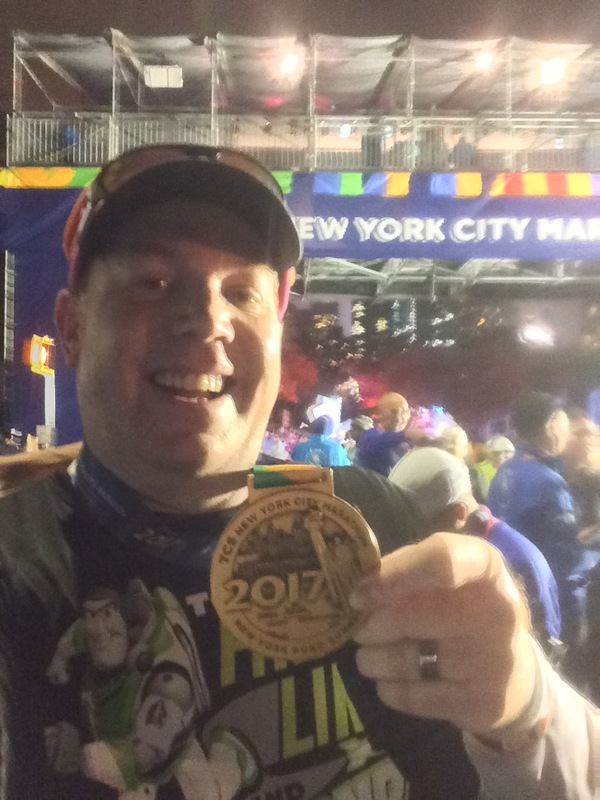 It was pretty exciting to be there in person! 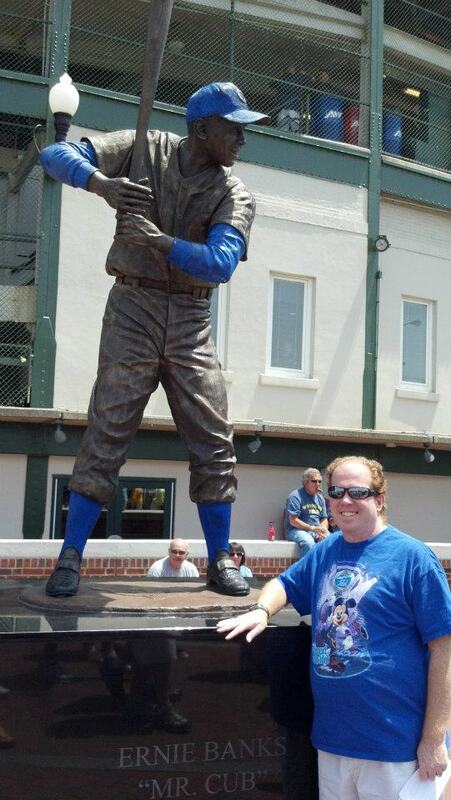 Just outside of the stadium, we passed by the statue of Mr. Cub himself…Ernie Banks. 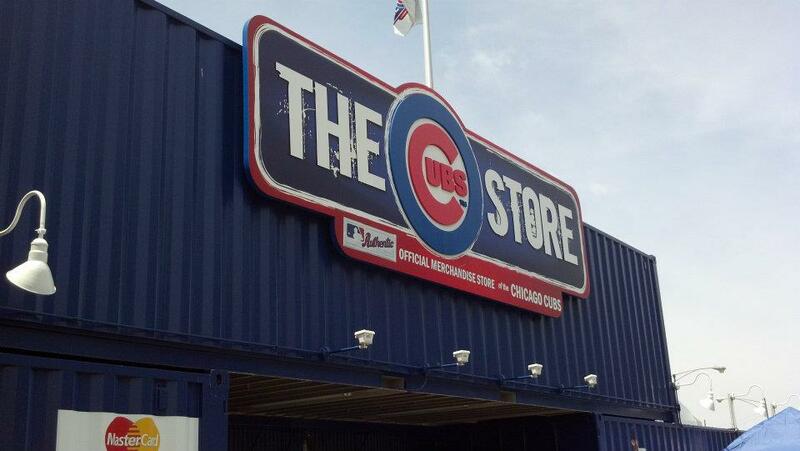 Across the street is the official Cubs Store. I had to go and purchase some Cubs gear for the game. It had to be at the official store. With the official Cubs gear purchased, it was time to head inside. To say that I was thrilled to be there would be a huge understatement. All of the history in this stadium. All the games I watched on WGN Television when I was a kid. I was actually on my way inside! There was a huge crowd for this game. The Cubs were playing the Detroit Tigers. It was like reliving one of the World Series from the past. On the way in, I saw these guys. 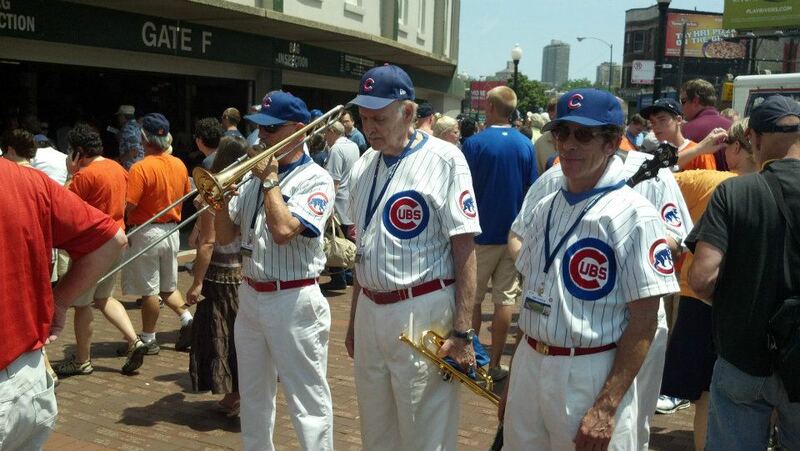 I don’t know if they are an official Cubs combo band or not. However, it was fun to see them. 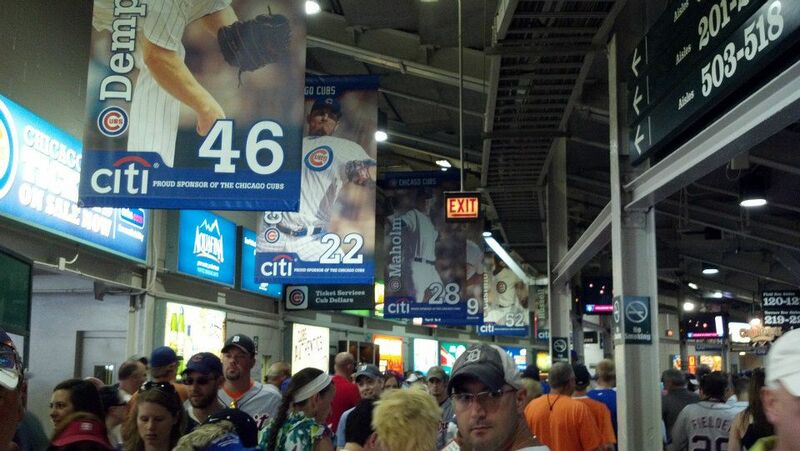 Once inside, it was kind of crazy with so many people lining the concourse. 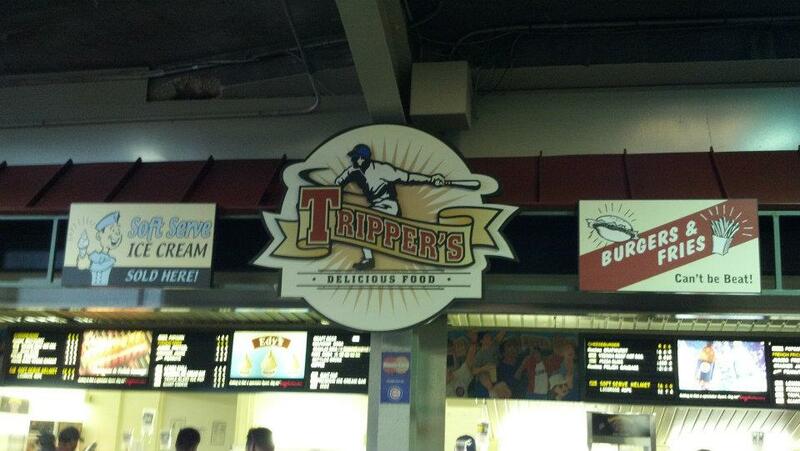 At Wrigley Field, this is the only level where concession stands are. I found that to be surprising. Of course, that just makes things very crowded. After all, a sell out crowd and all of them coming to one level for their food. I thought all the old school signs were very cool! 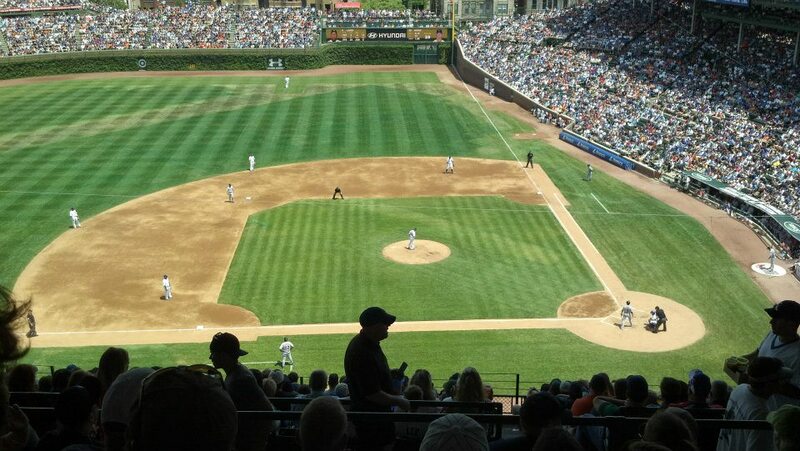 Everything about Wrigley Field screamed classic baseball! Brooke and I were sitting in the top deck. So, we had to make our way up. 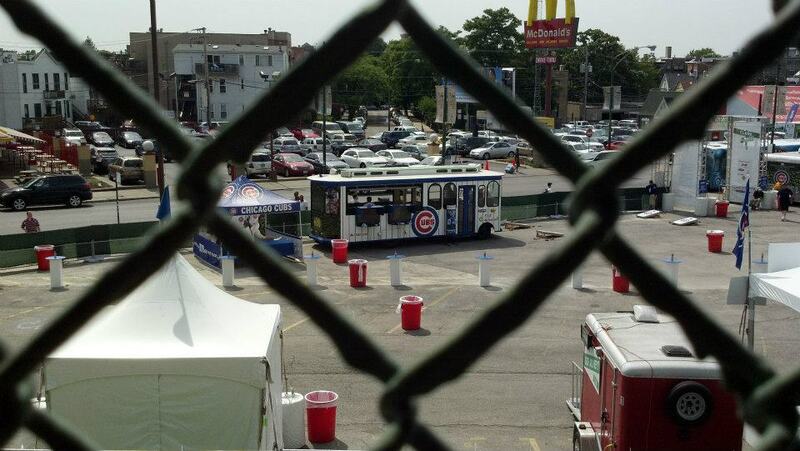 You can tell that Wrigley Field has made additions over the years to expand seating capacity. The ramps to get you to the top-level were like making your way through a maze. During the game, people would just stand along the ramps to watch the game. I don’t think these people had “standing room only” kind of seats. It’s just how they chose to watch part of the game. Also, if you notice the walkway isn’t very wide. 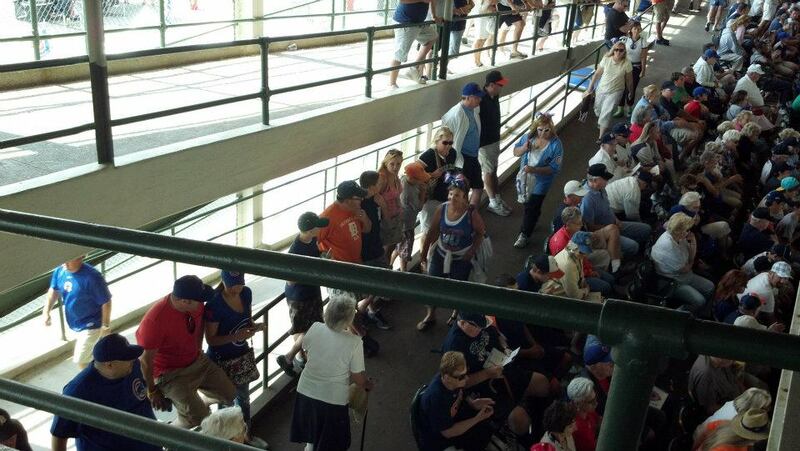 You have the people sitting in actual seats who weren’t very far from those sitting on the rails. If you were to view the game from the walkway, this is what your view of the game would look like. While I’m sure that a scoreboard like this didn’t exist in the early days of Wrigley Field, it’s still pretty old school. Love it! Here is the view from our seats for the game. 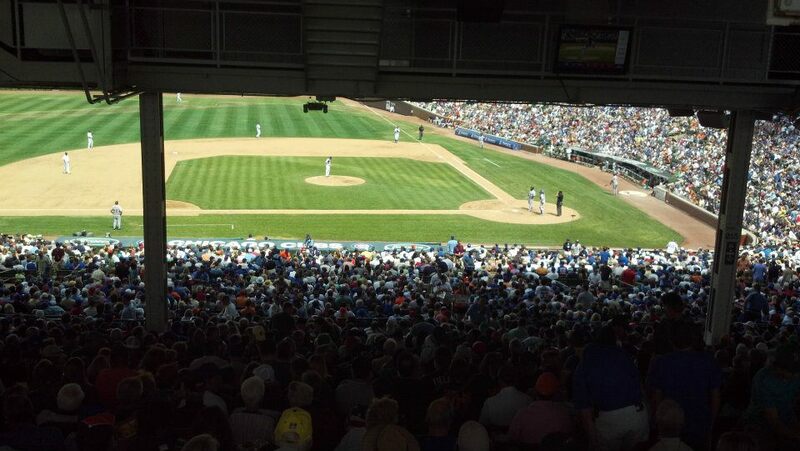 The nice thing about Wrigley Field is that there really isn’t a bad seat anywhere. As you can see, we weren’t too far from the top row of the stadium. At least we were in the shade! I know this is a little blurry. 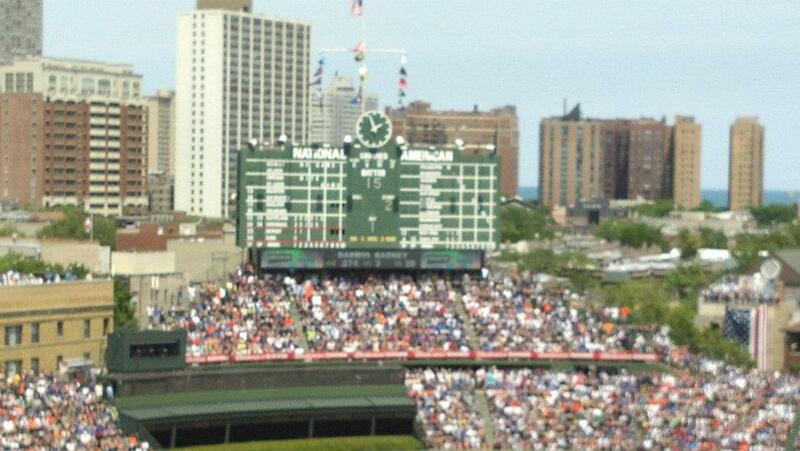 However, this is the old school score board. 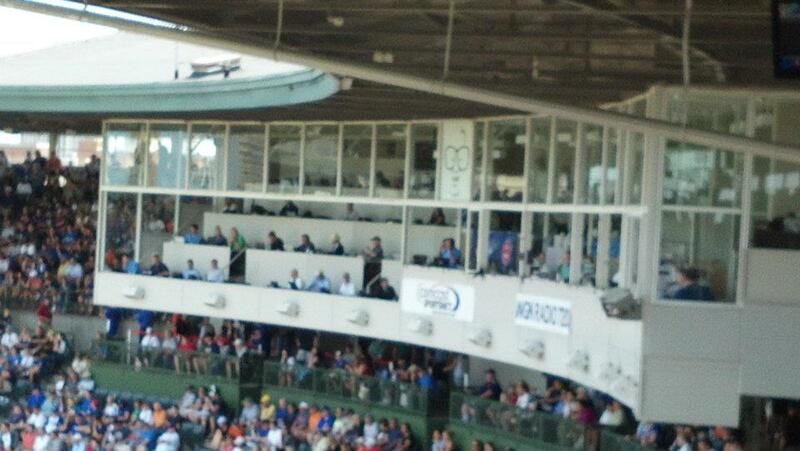 Also, in the press box, you’ll see Harry Carey’s face. He was the iconic Cubs announcer. He may no longer be alive, but he’s not forgotten. Among other things, Harry Carey is known for leading everyone in “Take Me Out to the Ballgame” during the 7th inning stretch. It was kind of cool to be at Wrigley Field as they sang this song! The game didn’t end well for the Cubs. However, it was so much fun! After the game the fun times buzz continued. Lots of people leaving the stadium! 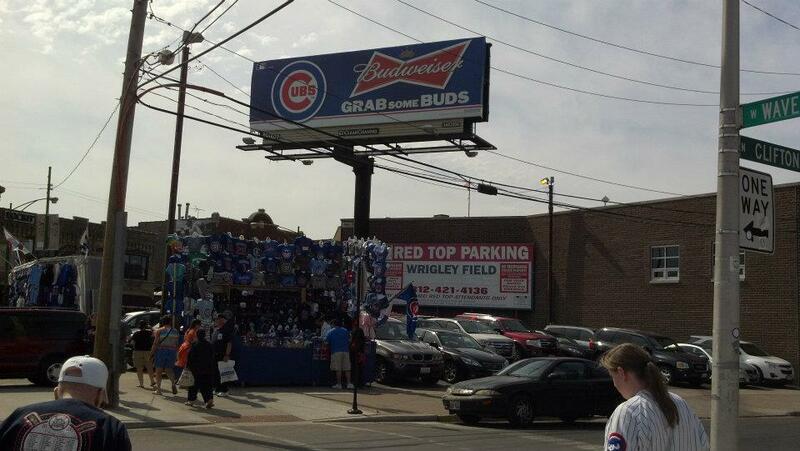 The area around Wrigley Field is known as Wrigleyville. You’ll find lots of signs showing their support for the Cubs. 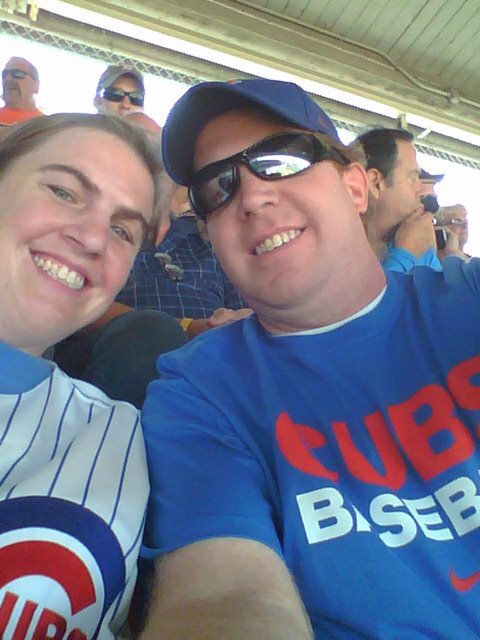 Even though the Cubs lost, we all has so much fun! However, with the game over, it was time to get on the Wrigley Express and head back to where Brooke’s grandfather lived. The Cubs may not be one of my favorite teams. However, I’ll always have a soft spot for them. I’m so glad that I got to see this historic stadium! Check one item off the bucket list. 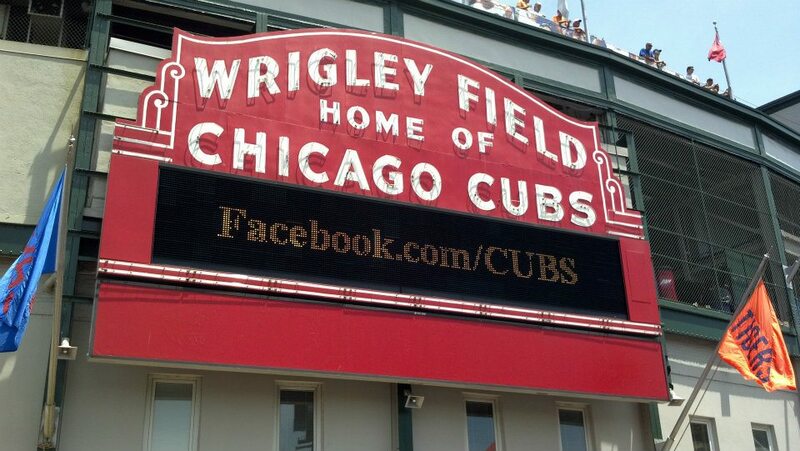 Have any of you been to Wrigley Field? Sorry for all the baseball posts. Todays post was inspired by the fact that Wrigley Field turned 100 years old yesterday. If you haven’t been, I would highly recommend taking a trip to the old ballpark. Want to be like Meb?